As Christmas 1969 beckoned, Jimi Hendrix, bassist Billy Cox, and drummer Buddy Miles engaged in extensive rehearsals for their highly anticipated appearances a t the Fillmore East in New York. Branded by Hendrix as the "Band Of Gypsys," the trio worked feverishly rounding such exciting new original material as "Izabella" and "Machine Gun" into form. Keenly aware of the special significance his forthcoming concerts represented, Jimi wanted to prepare something extraordinary for his audience. To mark the occasion in his own inimitable fashion, Jimi readied this special medley of holiday favorites to celebrate both Christmas and the dawning of a new decade. This recording was made at Baggy's Studios, a Manhattan rehearsal facility the group preferred. It by no means should be considered a polished studio recording made to Hendrix's exacting specifications. It is, instead, perhaps even more revealing. This is a glimpse of Jimi simply having fun in the company of close friends. The photograph of Jimi posing as Santa Claus was originally organized on behalf of the UK music newspaper Record Mirror. 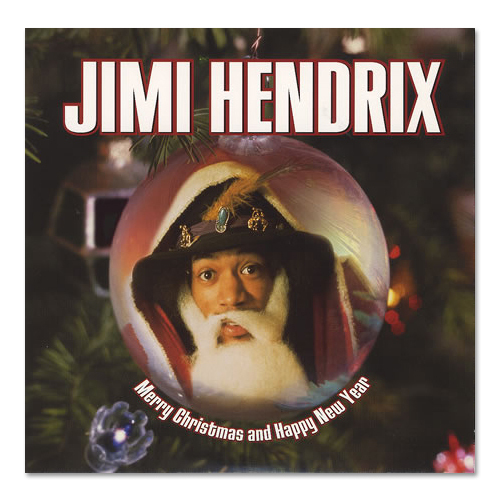 To help publicize the December 1967 release of Axis: Bold As Love, the group's second album, Jimi agreed to pose as Santa for the issue's cover. An alternate photograph from that session, with Jimi bearing gifts in the form of Axis: Bold As Love, is featured here. As an added bonus, also included is Jimi's playful "Three Little Bears". This track was recorded with the Experience at the Record Plant in May 1968 during sessions for Electric Ladyland. Bypassed for that album, "Three Little Bears" was originally issued as part of the 1972 posthumous compilation War Heroes. It has been unavailable in the US for nearly twenty-five years.